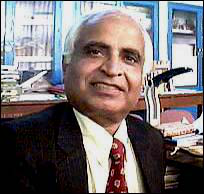 DR. SHIV KUMAR CHAKARVARTI, born on May 1st, 1945 in Hyderabad, Sind. He has completed his matriculation and graduation from Punjab University, M.Sc. (Physics) and Ph.D. (Physics) from Agra University and Kurukshetra University, respectively. His fields of interest are Nano-/micro Technology, Electronics, Instrumentation, Experimental Nuclear Physics/Engineering, General Physics, Solid State Physics, and Remote Sensing. Presently, he is working as a Professor and Asso. Dean Research and Development at Manav Rachna International University (MRIU), Sector- 43, Faridabad, Haryana, India. Prof. S. K. Chakarvarti also served as a Dean Academic, Chairman and Professor, at Physics Department, National Institute of Technology (Institution of National Importance), Kurukshetra, Haryana, India. INNOVATIONS/CONTRIBUTIONS IN TEACHING: In the pursuit of teaching and learning, the visual and audio strategies and displays have a potent role to play in the efficient, purposeful and accomplished dissemination of knowledge. Keeping this in mind that seeing is more powerful than hearing; Prof. Chakarvarti had developed many Lecture-Demonstration set-ups for use in class and laboratory as well. This change in otherwise routine teaching pursuit strategies has a remarkable effect on the students as assessed from the feedback received. The demonstrations include working models/displays and experimental setups illustrating the basic principles of Electromagnetic Induction phenomenon, Optics and associated aspects, electronic modules (logic combination gates), teaching aids besides some demonstrations simulating the nuclear scattering phenomenon etc. Prof. S. K. Chakarvarti, has organized various stage shows at different colleges and national conferences, some of them are mentioned below: (H.P.University,Shimla; Guru Nanak Dev University,Amritsar(IAPT National Conference);Panjab University,Chandigarh; Govt College for Girls,Chandigarh; Panjab College of Engineering, Lalru,Panjab; Govt College, Bhatinda; Govt College, Ludhiana;MLN College, Yamuna Nagar;Khalsa College, Yamuna Nagar; DAV College for Women,Yamuna Nagar;IB College, Panipat; Haryana College of Engg and Technology, Kaithal;Kurukshetra Science and Panorama Centre, Kurukshetra; KLM Dav College for Women, Faridabad; GGGSD College,Palwal; Govt PG College,Karnal; DAV College for Women, Karnal ; MVN College of Engineering,Palwal, Aggarwal College, Ballabgarh etc.) Read Also:DR. POONAM TANDON, PROFESSOR, Physics Department, University of Lucknow As an outcome of Prof. Chakarvarti interest in innovative methods of teaching and learning Physics, he has been published 23 research papers/articles on demonstration/ teaching pursuits in International /National Journals of repute (details, given below). Besides this, Prof. Chakarvarti as a Chairman Board of Studies has also been actively involved in curriculum development/syllabi modification and revision of Kurukshetra University, NITKurukshetra besides other universities, which is an equally important activity in teaching sphere. Prof. Chakarvarti had taught M.Tech Instrumentation and M.Tech nanotechnology classes besides UG B.Tech, guided research (published more than 615 research papers with more than 855 citations), produced more than 17 Ph.Ds (details are given further), Ex-Chairman, Ex-COE, Ex-Dean Academic at National Institute of Technology, Kurukshetra, India and Presently Asso. Dean Research & Development & Professor ECE at Manav Rachna International University, Faridabad, India. Prof. Chakarvarti served as an expert member on the panel of National Board of Accreditation (NBA), All India Council of Technical Education(AICTE), New Delhi, and expert member on the panel of Conferred Membership of American Nano Society. Read also: DR. V. K. JINDAL, SUPERANNUATED AS PROFESSOR AND COORDINATOR OF NANOSCIENCE AND NANOTECHNOLOGY FROM THE DEPARTMENT OF PHYSICS IN PANJAB UNIVERSITY, CHANDIGARH. . PROFESSIONAL EXPERIENCE : Total Teaching Experience: 48 years (UG: 48+ years, M.Tech Instrumentation: 33+ years, M.Tech nanotechnology: 3 years) Had taught M.Tech Instrumentation and M.Tech nanotechnology classes besides UG B.Tech, guided research (published more than 680 research papers with more than 1575 citations), produced more than 18 Ph.Ds(details given further), Ex-Chairman,Ex-COE,Ex- Dean Academic at National Institute of Technology, Kurukshetra, India and Director Research and Admissions/Assosc. Dean Research & Development & Professor ECE at Manav Rachna International University, Faridabad, India.